It was a bold experiment in a brave new world. The Narkomfin building in central Moscow was built in the late 1920s for employees of the People's Commissariat for Finance, or Narkomfin for short. It was an unprecedented concept of communal living. There were to be shared dining facilities, a laundry, and a kindergarten. Today, it is scarred by neglect and decay. Now Alexei Ginzburg, grandson of the building's designer Moisei Ginzburg and himself an architect, dreams of restoring and reopening the building as serviced apartments. The corridors - even though they have clearly seen better days - are pleasantly spacious. 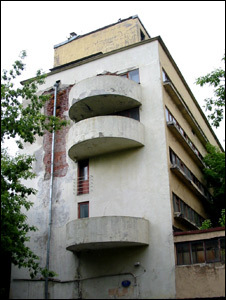 They were built deliberately wide - a communal space for the Communist era. The flats themselves were built on two floors, with the entrance door either on the upper or lower level. From the sixth floor, a staircase leads to the roof garden. It was here that I began my tour with Mr Ginzburg. "The idea was to have all the public functions, all the social functions, necessary for inhabitants of the house close to them," he explained. We were looking at a large building separated from the main block, but joined to it by a walkway. "The canteen has been there, and the sports hall has to be down there, but in fact the kindergarten was in the place of the sports hall, because the kindergarten also has to be constructed on the middle of this site but it hasn't been realised." Much of this building's history is of things which were not realised. The years of World War II took their toll, the socialist system itself eventually collapsed. Mr Ginzburg wants to make sure his plans bear fruit. "The main idea all through these 20 years that my father, and later me, were involved in this process of saving the house was just to restore it, and turn it back to its original shape." 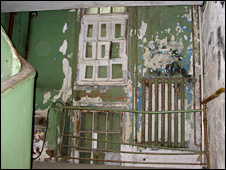 The decline of the building has driven many of its inhabitants to leave. Valentin Suvorov is still there. Now in his late twenties, he has lived in the building all his life. 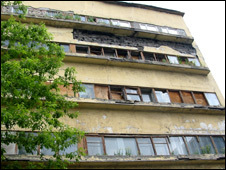 "I remember this building when all inhabitants lived here, but now, from 60 flats, only 11 are left," he told me. Our conversation was punctuated with the sound of water dripping from a cracked pipe in the corner of the room. What seemed really striking about the building was that although it was constructed within living memory, its inspiration is now so firmly in Russia's past that you could almost have been gazing on a Roman ruin. That is not the way Elena Gonsales sees it. She is the curator of an exhibition at the Moscow Architecture Museum which celebrates the era of Communal Living. For her, the true achievement of the Narkomfin building is not its historical status, but the architect's ability to anticipate urban life today. "Those living spaces envisioned by Ginzburg are really needed now. In a big city, there are a lot of single people who have breakfast in a coffee-shop, dine in restaurants, use laundry and dry cleaning," she told me. "Their lifestyle is exactly how people were supposed to be living in the Narkomfin building." Mr Ginzburg has a number of challenges to overcome including planning requirements and reaching final agreements with the remaining residents and others. Moscow needs to decide whether this 20th Century vision of the future has a place in the 21st Century. I had my own experience of communal living on Saturday night as I heard what sounded like my entire neighbourhood celebrating Russia's passage into the semi-finals of the European football championship. Football fans here have yet to come back down to earth. Instead, they are looking at the stars. Interfax News Agency quotes the President of the Russian Astrological School, Alexander Zarayev, as saying that Russia has a good chance against Spain. He talks of "a probable victory with a score of at least 2-1 in Russia's favour." I know that fans celebrating the win disturbed some people. But I would recommend James as a journalist go to the street and describe what was going on outside. It was a genuine spontaneous festive occasion, everyone was included, people everywhere were just congratulating and hugging each other. It looked like a carnival, and what is important, the Moscow police chief said that almost no one was injured. Football is the most popular game in Russia, but the Russian national team haven't won any serious championship for many years, that is why people were so happy. I haven't personally seen this building, so I'm basing the comment entirely on the article. If fixed up properly and renovated, would it really be so different than luxury buildings in, say, New York City, that cost thousands a month to live in? They all have closed-to-the-outside public gyms, entertainment rooms, a lot even have pools and food venues. I think it's all a matter of how money is applied to the restoration. 11 Dec: Rise of extremists?